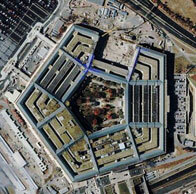 10 1/2 months prior to 9/11 the Pentagon conducted a drill of a commercial airliner crashing into the building. The renovation of the five floors in Wedge 1, approximately 1 million square feet of space, began in 1998. The project included major structural demolition, installation of new utilities, and the build-out of tenant areas. A phased move-in of tenants began in February 2001. The section of the Pentagon that was hit on September 11 was the first and only section of the Pentagon undergoing renovation to strengthen the building against a terrorist attack. Most of the top-level military brass, including U.S. Secretary of Defense Donald Rumsfeld, have offices on the other side of the building. 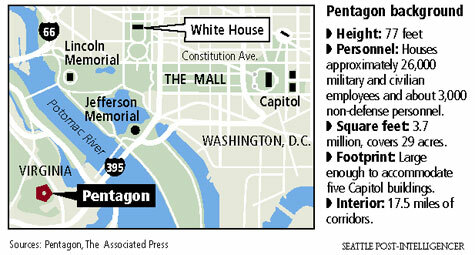 The west side is next to the Pentagon’s helipad. Much of the area was under renovation, meaning that the normal staffing levels were lower than usual. He said the plane struck the building almost in the middle of the space where the renovation had been completed. Personnel had not completely reoccupied this area of the building. “This contributed to the relatively low number of casualties,” Schwartz said. “The number could have been far greater had the plane struck another portion of the building not affected by the renovation.” He said one of the worst places the airplane could have gone was the building’s center court. "It’s ironic says Pentagon Renovation Manager Lee Evey that the hijacked airliner smashed into the very area of the Pentagon that had just undergone a renovation to strengthen the building against a terrorist attack. The death toll could have been much worse. Evey said the hijacked aircraft hit a portion of the building that had been renovated and reinforced with blast resistant windows, a special reinforced steel construction, and even fire-resistant Kevlar cloth." First of all, the saving of many lives is a good thing. It's the fact that they hit "near the middle" of the only section that had been "renovated and reinforced with blast resistant windows" where the "staffing levels were lower than usual" on the "other side" of the building from "the top-level military brass, including U.S. Secretary of Defense Donald Rumsfeld" one day before the completion of the renovation on "Wednesday, September 12th, 2001" that has generated some suspicion about the "well-coordinated" attacks. Copyright © 2005 PentagonResearch.com. All rights reserved.